With Molecular and Cellular Exercise Physiology, you’ll gain cutting-edge information on how exercise modulates cellular physiology. You’ll be able to use that knowledge to develop better training regimens and injury-prevention and rehabilitation programs. You’ll also be able to improve performance. 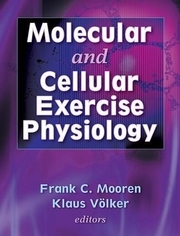 The book is unique in that it is the first comprehensive text to address the effects of physical activity on the cellular and molecular level. Recent fascinating advances in molecular techniques have extended the field of exercise physiology and enabled researchers to address the mechanisms involved on a subcellular and molecular level. Molecular and Cellular Exercise Physiology is a vital reference to help you stay on top of this exciting field. Professional reference for exercise physiologists, physiologists, sports medicine specialists, sport nutritionists, and exercise biochemists; text for upper-level undergraduate and graduate students in exercise physiology, sport and nutrition, human biology, and physiology. Frank C. Mooren, MD, is associate professor at the Institute of Sports Medicine at University Hospital Muenster in Germany, where he leads a molecular exercise physiology research group. Drawing from an academic background in medicine and chemistry, he worked as a researcher at the Max Planck Institute for Sytemphysiology in Dortmund. He has also been a consultant in internal medicine and sports medicine at the University Hospital Muenster. Dr. Mooren is a member of the American College of Sports Medicine and the International Society of Exercise Immunology. He received the Heinz Zumkley Prize from the German Society on Minerals and Trace Elements in 1997 and the Arno Arnold Prize from the German Society of Sports Medicine and Prevention in 2001. Klaus VÃ¯Â¿Å“lker, MD, is director of the Institute of Sports Medicine at University Hospital Muenster in Germany, where he established a group for molecular research. He has devoted his career to the study of both sports science and medicine. He is vice president of the German Society of Sports Medicine and Prevention and chairman of its Commission of Sports for Youth, Leisure Time and Seniors. He is vice chairman of the Commission of Health of the Landessportbund NRW. He is a member of the American College of Sports Medicine, European College of Sports Medicine, and European Hypertension League.